Spring 2013 Lake Cumberland Turkey Hunt. Last November, we wrote about the end of the excursion season for Wounded Warrior Outdoors. 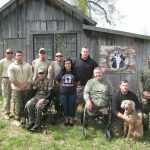 With the return of warmer weather, the organization is back to hosting the outdoor adventures for wounded military personnel. The year started in April, where there were two different turkey shoots scheduled. One of the turkey hunting excursions was in the Fredonia area. The community gave great support the Wounded Warrior Outdoors organization and its volunteers. During the trip, each participant is partnered with a local guide and caller for a personalized hunting experience. There are future outdoors trips planned throughout the year including fishing in Alaska, bear hunting in British Columbia and alligator hunting in Florida to just name a few. 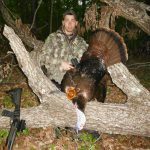 Wounded Warrior Outdoors is a non-profit organization for wounded, but active duty military men and women that provides therapeutic outdoor adventures in the United States and Canada. Wounded Warrior Outdoors works with doctors, nurses and therapists at Walter Reed Medical Center and Balboa Naval Medical Center. The medical teams nominate the candidates for the trips. The participants in the trips can achieve more positive therapy in one day of an outdoor adventure than a week of therapy at a hospital. The trips, which exciting for the hunting portion, also brings along challenges for the participants depending on their injuries. However, by the end of day one, the challenges are overcome and new challenges are met. There are medical personal on each trip to give extra help if or when it is needed. The excursions are free to the military servicemen or servicewomen. 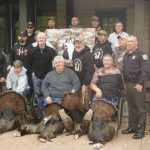 The trips are paid fully by donations and money raised throughout the year to Wounded Warrior Outdoors. The staff for the organization are volunteers and do not get paid for their work. The lodges or homes that host the trips are also donated to the organization. One of the big fundraising events for the organization is Cocktails for a Cause held every February at the University Club of Orlando. It was recently announced that 10% of the funds raised by the 4th Annual Nimitz Golf Classic on 6/14/2013, will go to Wounded Warrior Outdoors. There are also corporate sponsors such as Southwest Airlines, Inside Self Storage, Rabco Corporation, Wild Sheep Foundation and others. If you would like to donate to Wounded Warrior Outdoors, see their website to find out how. Stop N Stor has been a proud supporter of Wounded Warrior Outdoors for the past 2 years. Stop by our locations to find out more about this extremely important and giving organization. Stay tuned for more updates on Wounded Warrior Outdoors throughout the year. Moving is a common occurrence for military personnel and their families. Assignment changes and deployments can happen on short notice requiring the military members and their families to quickly develop a moving or deployment plan. Military families learn to easily adapt and plan for any situation. For new military personnel planning for the first deployment or move can be a challenge. It is important to remember that the more that you can plan ahead, the better it is. Stop N Stor has 5 storage facilities in the greater Hinesville & Savannah, Georgia areas located near Ft. Stewart and Hunter Army Air Field . Ft. Stewart is the home of the Army’s 3rd Infantry Division and the largest military base east of the Mississippi River. There are over 20,000 soldiers stationed at Ft. Stewart and Hunter Air Field. Currently, there are 9,000 soldiers from Ft. Stewart deployed to assignments around the world. If these deployments are for up to a year, it is a good idea to put personal items into a self storage unit during the time away. It is a safe and economic option for military personnel. The most important thing to do when you are renting a self storage unit is decide what items you need to take with you during your assignment and what items can stay in storage. If you have to store an entire home or apartment, it might be a good idea to invest in a climate controlled storage unit to protect your electronic items over long-term storage. Placing a car in self storage during deployment is also a great idea. With the proper pre-storage preparations, the car will be ready for use when you return home. The self storage industry supports many different aspects of military life from sending essential gift boxes to supporting our wounded heroes. Stop N Stor is proud to support Wounded Warrior Outdoors , a non-profit organization that gives therapeutic outdoor adventures to wounded, but active duty service men and women. Stop N Stor also supports “Enlisted Angels”, a group, based at Ft. Stewart to help empower and support military wives. Stop N Stor also offers a 10% discount to active duty military personnel . Thank you to every member of the military past and present who have fought for and defended our freedoms! The 2013 baseball season kicked off on April 4th for the Savannah Sand Gnats . The Sand Gnats are the Class A minor league team of the New York Mets organization. The team is led by manager, Luis Rojas, the same manager from the 2012 season. The Sand Gnats were 5th in the South Atlantic League for the 2012 season with a 69-67 record. So far, in this early season, the Sand Gnats are looking good with a 21-15 record and the close second in the South Atlantic League Southern Division. The team’s record at home is even better at 14-6! The Savannah Sand Gnats play at Historic Grayson Stadium , which originally opened in 1926. The stadium has hosted baseball games, football games, concerts and more over its long history. Savannah was hit by a very destructive hurricane in 1940, which caused a lot of damage to the stadium. General William Grayson led a fund-raising campaign and the rebuilding of the stadium occurred in 1941. There have been many renovations throughout the years, with the most current taking place in 2010 with the addition of Land Shark Landing, a 3 level deck and picnic area next to the first base general admission bleachers. The area is great for private parties or just a place to enjoy a baseball game. The Sand Gnats organization is very involved in the Savannah community by offering many different fund-raising events throughout the season. Every Wednesday at home games, is “Pack the Park for Charity”, where a portion of the proceeds of ticket sales go to a specific non-profit organization. There are Girl and Boy Scout nights at the ballpark, food drives, a Pink in the Park event and a Coastal Health District Healthy Heart Home Run 5K Trot on June 29th. The team will also give away tickets to non-profit organizations. There are also special discount promotions sponsored by local businesses and organizations throughout the season as well such as Kroger’s $1.00 Mondays, Natty Light 2 for Tuesdays, Budweiser Thirsty Thursdays, Facebook Fridays, weekend fireworks, and military appreciation events. The team mascot, Gnate the Gnat is a fan favorite at events in the Savannah area throughout the year. You can follow the Sand Gnats on Facebook and Twitter for more promotional events and ticket information. Stop N Stor wishes the Savannah Sand Gnats a successful 2013 season. May and June signal the end of the school year. This also starts the graduation season for high schools and colleges. The graduates are preparing for the next chapters in their lives, while the undergraduates will usually move home for the summer, work for the summer or do an internship. The end of the college school year means that it is also the season to pack up the dorm room or college apartment, pack up the car or van and move it all back home, just to pack it up again and move it back to college in the fall. There has to be an easier way for college students, faculties and their families! Renting a self storage unit is a great option to help lessen the stress of moving the dorm items back home and then back to college again. Renting a self storage unit is a simple relatively low-cost option to store items when school is out of session. Many self storage operators realize that college students and faculty members are important to their business, so they offer special incentives for college students. Stop N Stor offers 10% off of storage rental to local college students and faculty at our Savannah and Port Wentworth facilities. The student must present a valid college ID at the time of the rental. When choosing a self storage unit, make sure that it is close to your college or university, so you can easily access the items. Self storage operations usually are month-to-month rentals, which is perfect for the college student. Choose the correct size and type of storage unit for your needs. If you are storing electronics or nicer furniture, invest in renting a climate controlled storage unit for the summer. Climate controlled storage units protect items from extreme humidity and temperatures. If you are storing dishes, pots and pans, linens and clothes, then it would be okay to rent a non-climate controlled storage unit. If you are graduating from college, it is a time of great changes in your life. If you have a job, you could be moving to a new city or state. If you are not sure what sized apartment you will need in your new city, then it would be a good idea to store your college items in a self storage unit until you get settled. You could be living in a micro apartment in a big city. These apartments will only allow you to have the bare necessities and not all of the “stuff” that you have collected throughout your college years. Once you are settled in your new home, then remove your items from the self storage unit. Self storage is a great option for the college student and the college graduate. Storing your college items is a much easier task than repeatedly moving them to and from school. Stop in to Stop N Stor and see how we can help with your storage needs. Stop N Stor congratulates the Class of 2013! Best of luck with all your future endeavors. There has been a growth in the number of farmers markets in Georgia in the last few years. The temperate climate allows farmers in Georgia to have a growing season for most of the year. This is great for the farmers and for consumers. Farmers markets have become a main stay in nearly every town square. Every Saturday morning from 9am to 1pm, Savannah hosts the Forsyth Farmers Market . Since 2010, there has been a farmers market in Hinesville, Georgia from the middle of March to late October. The Hinesville Farmers Market officially kicks off its summer season this Thursday, May 2nd at Bradwell Park in downtown Hinesville. The hours for the market are 4pm-7pm every week. The Hinesville Farmers Market’s mission is to provide the community with the ability to purchase fresh, homegrown produce and agricultural products from local area growers. The market helps to strengthen the local economy and enhances the community’s quality of life. There are also special events at the market including the 2nd Thursday in the Park, which includes performances by local musicians, Demos and Samples Night, where you can sample some food by local chefs, and Go Pink Night, held in late October to support Breast Cancer Awareness. There are a variety of vendors at the marketing including those that sell the following: grass-fed beef, fresh bread, homegrown produce, cheese and freshly made pastas, handmade candies and chocolates and more. There is an application process to be a vendor. You can find more information about this process on the website. Keep an eye out for weekly market updates on the Hinesville Farmers Market social media pages: Facebook and Pinterest. The Hinesville Downtown Development Authority works to create a sustainable, revitalized and vibrant downtown that is an economic hub and enhances the quality of life for the community. They work to bring events and activities to downtown Hinesville throughout the year. Stop N Stor is very proud to be a member of the Hinesville community. There are three Stop N Stor locations in Hinesville that can help you in all your storage needs.